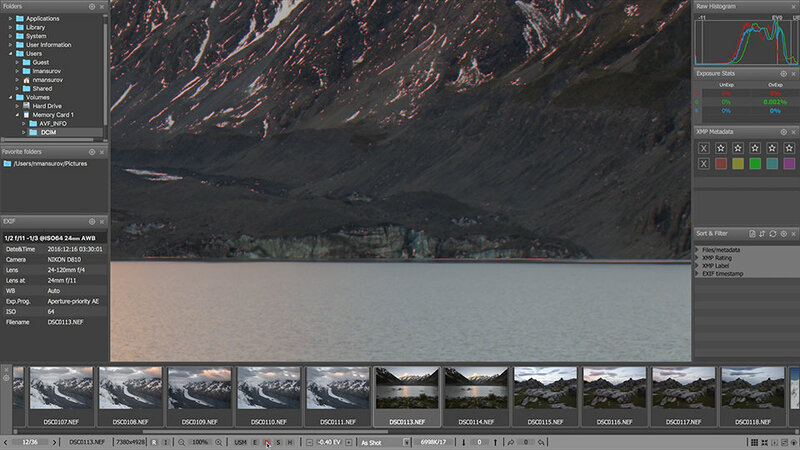 As you might already know, Lightroom is extremely slow when it comes to image culling. Although Adobe updated Lightroom CC to be able to fetch embedded JPEG previews from RAW files for the sole purpose of speeding up image culling, the process is still painfully slow when going through many images. In addition, looking at the embedded JPEG previews from the camera is far from ideal due to the fact that JPEG images do not contain enough information to be able to judge underexposure and overexposure. On top of that, if one has particular color, sharpness and other settings set on their camera, those settings could seriously impact JPEG previews and lie about what’s actually contained within the RAW file. In order to avoid such issues and move away from Lightroom’s horrid performance, I have completely moved my image culling process to FastRawViewer. Thanks to this lightweight and powerful software, I am able to cruise through hundreds of images and select the ones that I will import and edit, while making sure that bad images never make it into my post-processing software in the first place. As a long time Lightroom user, I have been extremely frustrated with its lack of performance, even on the fastest PC I can build. While I can understand that software can be slow when doing the actual editing (since it is a complicated process that might require a lot of computer resources), going through images, zooming in and out them and starring / color-labeling them should not be as painful as it currently is in Lightroom. Adobe has been promising to make Lightroom faster, but its overall performance seems to only be decreasing with each new release, which is unfortunate. To make the process of culling images in Lightroom faster, Adobe updated Lightroom CC to be able to show JPEG images embedded into RAW files, so that one does not have to wait for each file to get re-rendered with the “Loading” notification that takes forever to clear. However, even after this feature was rolled out in Lightroom CC, I still encountered a lot of slow downs when doing basic operations, such as moving between different RAW files. 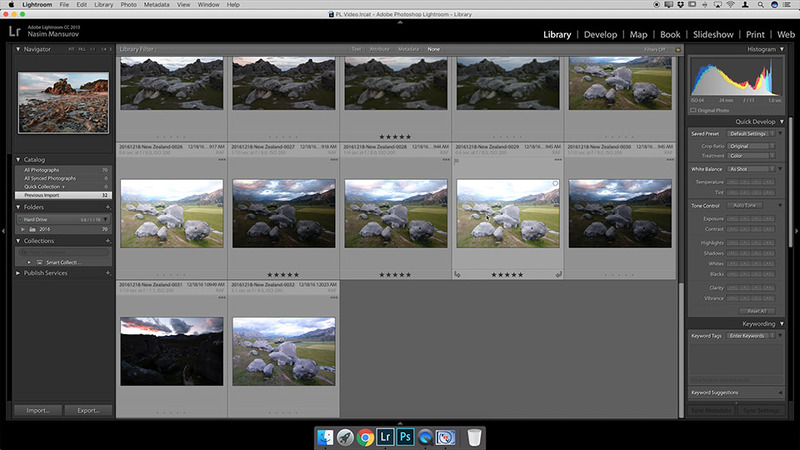 In short, as of today, Lightroom is simply an inefficient piece of software for image culling. 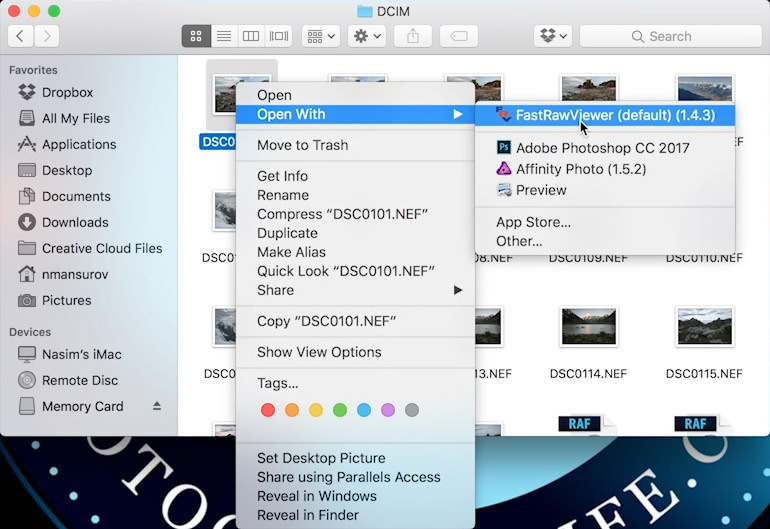 Because of this, many photographers rely on third party software such as Photo Mechanic and ACDSee for basic image culling and file management. For years, I relied on using ACDSee for image culling and I was relatively happy with its performance. However, I was not happy with its slow update cycles, making it difficult to use it when shooting with a new camera, and I always knew that I was looking at embedded JPEG images instead of real RAW files when assessing files. FastRawViewer changed all that. Not only is it far faster and more efficient than any other image culling software tool I have tried to date, but it is also very accurate for evaluating RAW images. With all other RAW viewers, I always wondered if my images were truly overexposed or not, so I had to leave the ones I doubted to be imported into Lightroom in order to see if they were salvageable. With FastRawViewer, I no longer have to do that – I can quickly decide whether an image is a keeper or not by looking at the accurate Histogram and I have other tools to assess image quality at 1:1 pixel level view. Camera updates happen even faster than Adobe’s and thankfully, I don’t have to spend upwards of $100 for all this! If you have never used FastRawViewer before, go ahead and download a trial version for your PC or Mac from FastRawViewer.com (and if you want to purchase, a PL-exclusive 25% discount code is provided at the bottom of this article). Once it is downloaded, installing the software is super easy – just follow the on-screen instructions and you will be up and running within a couple of minutes. Previously, my workflow used to rely on importing or copying images from my memory card into my computer. The main reason for that was speed – trying to view images from a memory card was a painfully slow and inefficient process. However, thanks to faster modern memory cards, FastRawViewer’s superb performance and its ability to read RAW files quickly and reliably, I started culling images directly from memory cards, which made it possible to eliminate bad images early on and only deal with images I truly need. 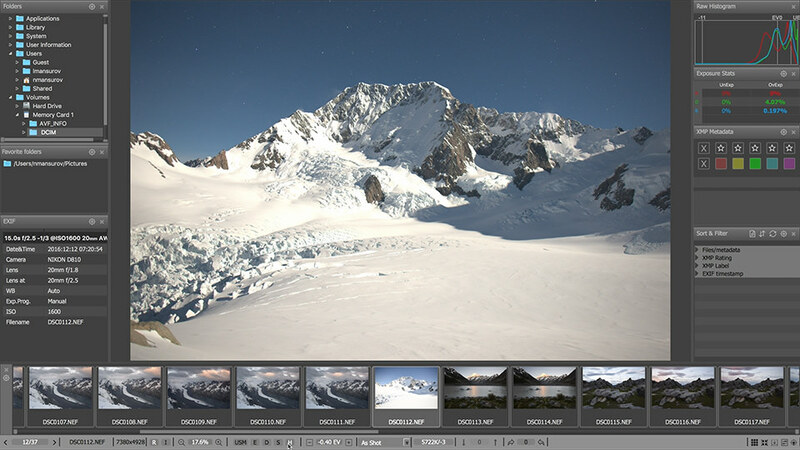 FastRawViewer makes it extremely easy to assess the quality of RAW images. In addition to the real RAW histogram, which is highlighted on the top right side of the screenshot above, you also have two additional bits of data – UnExp (Under Exposure) and OvExp (Over Exposure) in “Exposure Stats” window. If you are blowing out any highlights and the image does not contain enough information, you will be seeing percentage numbers on one or more of the RGB channels under “OvExp”. This is very helpful, because it is an easy way to see how much data you have lost in your RAW files. I typically rely on Exposure Stats quite a bit, since it is a very easy and quick way to assess RAW files. Before you do that, make sure you zoom into the 1:1 view by pressing the CMD+1 keyboard combination (CTRL+1 on PC). When looking through images, I always switch back and forth between 1:1 view and “Fit to Window” view (CMD+0 / CTRL+0) and I have my keys set up so that I can quickly navigate between images without having to constantly go back to the Grid view. Speaking of which, you can easily customize any of the keyboard shortcuts by visiting FastRawViewer’s Preferences (CMD+K / CTRL+K). As I show in the above video, going through images within FastRawViewer is extremely easy. But the most beautiful part is that everything is instantaneous – I do not have to wait for any rendering to take place, because the software is reading the RAW files on the fly! If your memory card is slow, or your memory card reader is too old, you might be disappointed by how slow RAW files open. If you experience this, you might be better off copying images from your memory card into your local storage first, then cull your images from there – you will gain a lot of speed by going this route. I personally like culling images directly from my memory cards, but if I have a few memory cards full of images and I want to cull everything at once, then I might copy everything to my local storage first, then take my time in going through everything. Also, always make sure that you have a backup of your images (I always back up images from my memory cards before I start image culling). So if you are not saving images simultaneously to two memory cards on your camera, or you don’t have any backups, you might be risking potentially losing your images. While FastRawViewer never deletes anything when culling images (files are moved to a “Rejected” folder), if your memory card is about to fail, additional write operations could make matters worse. Remember, the goal is to eliminate all bad images and only be left with real keepers that you will then import into your post-processing software of choice. You do not want to be losing any images in the process! We asked our friends at FastRawViewer for a special discount and they happily agreed! For the rest of February, you can use the discount code “LIBR-FO24-GCWQ” to get a 25% discount on all Libraw products! To purchase FastRawViewer, visit FastRawViewer.com. Please note that PL is not affiliated with FastRawViewer and we do not receive any commissions from sales. We support FastRawViewer because we love using it and we are hoping that the company will continue to innovate and improve its software! For more details about FastRawViewer, check out our detailed FastRawViewer review. Which one do you have? Was thinking about purchasing photo mechanic, but maybe this one is better… do you know the pros and cons between the two? Lauren, Photo Mechanic is a great file management and image culling software, but it is expensive, and it does not do the most crucial task, which is ability to look at real RAW images. Personally, I would go for FRV any day just for this reason alone! Thank you, Nasim! You are a MASTER! Is there any way to have some sharpness and clarity aplied to the image ? A preset as I have in my camera. I do like the speed but sometime I found the image look softer but was ok with some sharpness applied. I deffinitively need a program to cull my pictures! When you take 1000 of them it gets to be a painful process. Eric, since the image is RAW, it does not apply any settings to it and that’s a good thing, or it would take time. However, you can set a screen sharpening setting to make the image look a bit sharper. Find the “USM” button on the bottom of the FRV screen. Clicking it twice turns the USM button red and nicely sharpens the image. I always apply this setting. I have been using FastRawViewer for some time now, and it is great. Their is also a program called FastPictureViewer, which is even faster. It has less features the the former (not utilising raw), but it is great when you want to save time say pre-import. As for Lightroom, I have officially abandoned that. I use Capture One and DXO Phiotolab interchangable. C1 catalogues images and is much faster for browsing that DXO. I find DXO quicker for making edits to single prints once found, but maybe I know it better. Again both have advantages and disadvantages. Christo, not being able to view the actual RAW data is a deal breaker for me personally. I can see why it would be good for faster viewing, but for that there are plenty of tools out there. My favorite has always been ACDsee. One of the best things you did for my workflow is feature this software a couple of years ago! It helps greatly speed up the culling / importing process and is also a tremendous bargain. I didn’t know it at the time, but I would have paid much more for this software (and actually wish they would start charging for updates because I want them to make a lot of money and be around for a long time!). As you point out, the company is constantly updating their software to make sure it works with the latest cameras and to add new features. So, when you buy it, you get everything – a great program, a great price and great support. It’s one of 3-4 programs I’ve used through the years that is truly a no brainer. Thank you for your feedback Sceptical! I don’t know what I would do without FRV and I also really hope that the company does well, so that we see more innovation and great features in the future. I agree with sceptical1, particularly because I don’t use Lightroom, I use Capture One. While C1 has greatly improved its speed (as has my new computer) it’s still much slower than doing the culling with FRV. I’m glad you posted about this a while ago, it’s a great tool even for an amateur like me. Pius, the link to FRV is provided in the article. Thanks for the heads up to this valuable software. I too have seen the slowdown in Lightroom and also have a very fast and powerful home built PC. I hope to find a way with FastRawViewer to find images based on different EXIF data. I have 35,000+ images and would like to use this software to cull the many images I’ll never process. Thanks for the article Nasim! I will give FRV a try. So far, I have been using BreezeBrowser Pro to view and cull my files. It is fast by showing the embedded JPEG only which sometimes leads to issues you are describing. While I have LR on my computer, I always sour at using it because of the painfully slow import issues. In particular since I have no real use for the database and catalog features and don’t particularly like to have image information (or worse, entire images) hidden in some proprietary format. I mainly use photoshop and am in the process of getting more use out of DxO PhotoLab and Capture One for Sony. While also having a good look at ON1 RAW. I am surprised you are culling directly from the memory card; that’s something I would have a hard time getting used to although I see the allure of not having to import onto the computer hard drive something I am going to erase later anyway. And I do end up with more images on my hard drive than necessary in addition to some clean-up and sync issues with backups down the road later. Thanks for this excellent tutorial, Nasim. I purchased FRV a few months ago based upon your recommendation, but since I don’t shoot a lot, I had not learned to take full advantage of it. Your article fixed that. 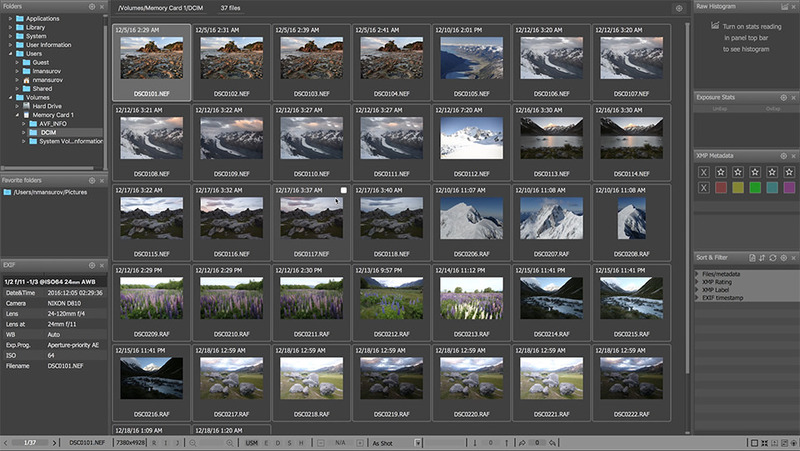 I have a question that does not fit the topic: ON1 software seems like it may be on track to be a serious competitor to Lightroom. Your review and comments would be valuable to a lot of us. I’ve had this software for quite some time and keep it updated. The problem I have (no doubt it’s my issue) is that no matter how many times I read explanations like yours and the tutorials, I can’t figure out how this helps me make decisions. Yes I can see “stats” on over and under exposure, but how do I, in a practical manner, use this information? Many times I have taken files that on the surface FRV might suggest be rejected due to exposure or noise issues, but once worked on in ACR came out beautifully. This is why to me seeing and playing with the RAW file in ACR seems more useful, even if it takes longer. Just in case I haven’t made it obvious enough, I am acknowledging this is a reflection on my inability to understand the software, not the software itself. Jim, I fully agree with you. However much I like FastRawViewer for the information it provides me about my images, in the end I do very little culling except for obviously missed shots. Many times, for a picture that isn’t technically right, I found interesting to process it a few weeks, months, or even years afterwards. I think it depends on the volume of images that you take. For me that will be a few thousands a year so it is still manageable and even though photography is my most advanced mode of expression and a reflection of my feelings, it is not how I pay bills and therefore I do not need to be productive. So I wouldn’t worry about not understanding the software, it simply is about your needs as a photographer. This is of course not a critic of the article, which as usual is well documented and practical. Much depends on how you setup FastRawViewer and how much you want to rely on highlight reconstruction in a raw converter. For example, if you uncheck “Apply Adobe hidden exposure correction” in FastRawViewer Preferences -> Exposure, you will see what is blown out in raw, and not what Adobe converter will blow out by default. – second, after the hidden exposure correction resource is used, it starts reconstructing missing information from the existing through interpolation. The amount of hidden exposure correction varies with camera model and ISO setting, we indicate it in EXIF panel as “BLE” (baseline exposure). Given the “Apply Adobe hidden exposure correction” is disabled, reconstruction of highlights in Adobe converters can be quite successful when less than 0.3% of the pixels in the green channel are blown out while other channels are intact. For neutral surfaces it is often enough when just one channel is not clipped. I prefer to keep clipping below 0.1%. Thank you for your suggestions. I will revisit some images and re view your excellent tutorials. If you go through a lot of images, like many sports shooters do, you can use the reject folder for keepers instead of rejects and then again cull the reject folder into a second reject folder for final keepers and filing into your own file structure before importing into Lightroom where you can cull again. For fast culling I use: Left arrow, back one image. Right arrow, forward one image. Up arrow, reject folder(actually keepers). Down arrow, view full image. 0 key, focus peeking. Mouse wheel, zoom. FastRawViewer’s focus peeking or detail button comes in handy also when fine tuning camera lens combos. Saving lots of time when using the Dock or TAP. Capture one is the perfect choice to work fast with your raw files. My FRV creates XMPs and LR read them but when I set a color label in FRV I don’t see the corresponding color in LR. Instead of a color label (highlighted in the toolbar + color frames around the thumbnails in Library & Develop Module as well as a small color box below the thumbnail in the Library’s grid view) I always get just a smal WHITE box below the thumbnail but NO frames and NO hightlighting in the toolbar. Thus, in the Develop Module I don’t see if the picture is color labelled or not. The only evidence is the WHITE box in the Library’s grid view. In opposite to this, ratings (stars) set in FRV are read from the XMP & displayed in LR as they shoud be. What I’m doing wrong? Would you know how to fix it? Could you please check that the names for the Labels in FastRawViewer are exactly the same as in Lightroom (language may be an issue here). You can use FastRawViewer Preferences -> Ratings & Labels pane -> XMP Label style: Custom to set the Labels in FastRawViewer the way you have them in Lightroom. Our support e-mail is [email protected] , please contact us with any questions. Thanks for your help, your fix worked straightaway. I run my LR in German, so I wrote Rot – Gelb – Grün – Blau – Lila into the fields for Custom labels and as for now LR understands the tags in XMPs created or modified in FRV. I think, people who run their LR in another language than English would appreciate a corresponding note in the User Manual. Thank you for letting us know that it worked. Yes, we need to add a paragraph to the Manual. Thanks for the update on FRV. I took a look and it looks really nice for culling. The only thing I feel I missing is a way to batch rename files as it imports them from the memory card. For the price it is impressive. Frank, I am sure that feature is coming. I have been asking Iliah Borg and his team for a lot of features, including batch file renaming. Would be nice to use FRV for image culling and file management! No, you cannot create data from zeros. While I’ll look at this, I can’t imagine anything faster for a first cull than FastStone Image Viewer. I like that I can double-click images to display full-screen, then hit M twice to move seconds to a folder I specify. Or I can hit C to copy keepers to a folder for further processing. With FastStone it’s dead-easy to do preliminary crops (press X) and sequence through files automatically to do quick crops. 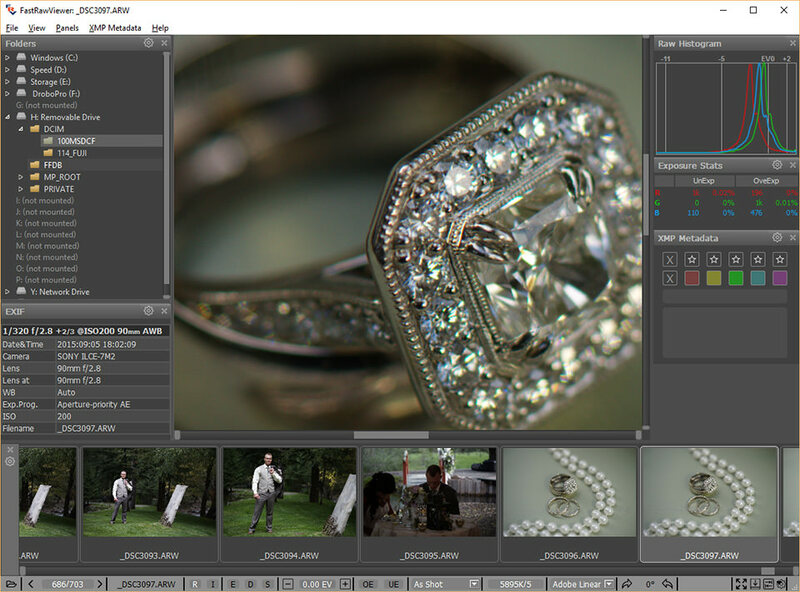 FastStone will display RAW files, even Fujifilm’s. I’ve been using it since you featured it last year. It seems to me the more I use it, the more the features built in become more relevant and more useful and I find myself looking a little deeper at the highlight/shadow areas before accepting or rejecting an image. The in depth videos on their site is also helpful is seeing the wealth of detail in the program and the thought process behind its development. I’m glad you revisited it as a fresh primer is always a good thing. I can grasp the logic of working directly from the memory card. No need to waste time loading over shots that are destined for the trash in the first place. A question it raise though is how to deal with any video files that are on the card. Sometimes I’ll shoot a few seconds of video as a supplement. But FRV does not seem to copy those over—or—am I missing some setting? Looks really useful. Can you think of a Linux equivalent? I’m using darktable for conversion, mostly, but it’s not ideal for culling large numbers of files. I ought to have a go at getting FRV to run in WINE – I’ll let you know if I have any success. Thank you. Have just got back from a trip with about 800 pictures. Using lightroom I culled it down to 150 pictures. It took ages to cull down the images to 150 pictures. I felt like I was going out of my tree with boredom. This then means that I am likely to make mistakes in my choices. I will look into Fast Raw Viewer. I need to read your review as there appear to be add on’s like Raw Digger that I have no knowledge on. I would like to throw another bit of software into the discussion; that being On1. I’m a long time Lr user but stopped buying at Lr5 — never went to CC at all — and have been working with On1 for about 12 months. Certainly not a smooth working relationship however the better bits out-weigh the poorer bits and atm I still prefer Lr for organizing. Bit to with knowing/understanding Lr already and the drama with On1 picking up every last keyword I ever typed!!! So my question is basically will FastRawViewer be better than the “fast On1” browse/organizer section? I’m a bit over buying/trying/learning new programs that often promise to do it all but they fail to mention what they don’t do or don’t do very well. On1 has been a real love it hate it affair; but I never totally regretted buying/trying/learning the program. I appreciat a lot your work on this blog, and I learned a lot from what you share. I use PhotoMechanic right now, but it’s very expenssiv indeed. I was ready to try and buy FRV, but the code you gave seems to be invalid ? I got this message : “entry.error.invalid.coupon”. Could you let us know if there’s a way to have a working one, please in order to buy it ? I use FRV as per your recommendation and I love it. The point I think people are missing is that it is a great tool primarily for showing exposure information. When you take a photo you look at the histogram and that may not be the true information – it may be shifted to the right. When you load the raw image in LR you are looking at the “generated” jpg imbedded in the raw file – and then the adobe modifications. The strength of FRV is that it shows you the true RAW file. I must say I’m dissapointed at FRV. At first I thought it was a perfect tool for culling, but for my use it is not worth the money. I’m an amateur bird photographer and I take all pictures with RAW. But if you look at a RAW image in FRV, you of couse see the RAW image, but that gives me a false impression of the quality. At first I almost deleted all my pictures using FRV and thought it was odd, that I suddenly couldn’t take sharp pictures. If I then looked at the deleted pictures from FRV in Lightroom, most of the pictures turned ud to be great. Even if I turned on the sharpen in FRV, it wasn’t fine. If I look at detail it shows part of picture sharp and again, in Lightroom it is fine. The only way FRV works for me is if I set it to show me the pictures in jpg, then I can see if they will turn out fine. But for culling i better like ViewNX-i. Maybe if your proffessional the FRV is better, maybe i’m using it the wrong way but for me it is a total waste of money. Tommy, please keep in mind that the software does not add any sharpening to images by default, whereas other software like Lightroom do. When you look at an image in FRV, you are seeing the actual RAW file, with no sharpening added to it. Once you get a hang of how the software works, you will be able to make decisions on potential deletes vs keepers. It does take a little time to get used to it, but it is worth it in the long run for me and many others who use the software. I bought the software after reading your recommendation. There is a major flaw. All raw file look blurry/mosaic like when viewing at 100%. The images look like they are upscaled. I have this problem for Nikon, Fuji, Sony and Canon raw files. and I don’t see this problem when I use LR, Photoshop or ViewNX. Can you help resolve this issue? I tried all different settings in the preferences and failed. I use Windows version. Shawn, please keep in mind that you are looking at an actual RAW file that has no processing on it – that’s what you want to see when you cull through your images. I would recommend to try using the “Display Fine Details” tool if you are having a hard time deciding on an image. You can add display sharpening through the software, but it won’t be the same as what other software like Lightroom do – they actually add some sharpening by default and re-render your image. I am not sure about “mosaic-like” comment though – it should not show any mosaics. Hi,Nasim.I recently bought the Combo FRV+Rawdigger,and I have a question for you (that is,if my recollections about your personal and occasional use of X-Rite’s Colorchecker Passport Plug-in for Lightroom are correct!) concerning the Application of White Balance in FRV to RAW Files (NEFs of Nikon D7200 + D3300,for that instance) during the Culling Process.As you already know when someone applies a Custom Camera+Lens Calibration Profile (made within Lightroom by the dedicated Colorchecker’s Plug-in) in the CALIBRATION Tab of Lightroom or ACR,the White Balance of any RAW Files is also automatically readjusted according to the Custom Profile’s interpretation of the Images’ RAW Data.My question is whether you actually use,or suggest using FRV for applying on-the-fly White Balance Corrections on any RAW File that is destined to have a Custom Calibration Profile applied to it later,once it has been imported in Lightroom for further editing,or will be developed through Adobe Camera RAW.I would like to thank you in advance for your precious time,and considerate reply,and note that I actually ask such a technically-laden question here only because our Workflows bear great resemblance,and your opinion as a more seasoned photographer than me -Having been involved in Digital Photography and processing only since 2011- could also benefit many other Photographers seriously involved in editing RAW Files in a Color-managed Environment. Like many I want quicker / better ways to sort and find “the good ones” / keepers. I tried FastRawViewer and found it a very interesting approach — seems to be very configurable which is always a big plus. Lacking for me is keywords and comparing more than one picture and renaming would be a plus also. I could possibly come around the lack of those three and use Bridge in addtion, _but_ I do not see how FRV is helpful for me, because it does not allow me to judge the sharpness of the images — which is for most images a crucial component if it is a keeper or not. When I zoom in to 100 % I see the coloured pixels at edges which do not show me in any way how the rendered image will appear after RAW conversion (because _no_ one needs / wants to see a RAW in the end). The USM sharping function for screen display does not help here either, because it just bumps up the contrast of those colored pixels. If there’s a setting I have overlooked I would like to hear that but I guess that’s the nature of the game here. I looked at some example photos I took and no way I can make a meaningful decision about to keep or not a photo. I get that knowing the RAW histogram would be useful, _but_ IMO not in exchange of lacking the other informations of the photo. In that case I think one is quicker and better of to judge the jpegs and keep in mind that to quite a large extent over- or underexposed parts can be brought into a useable range, while unsharp photos will normally not be able to make usable! “display details” (aka peaking function) is not the sole solution to judge sharpness BTW.